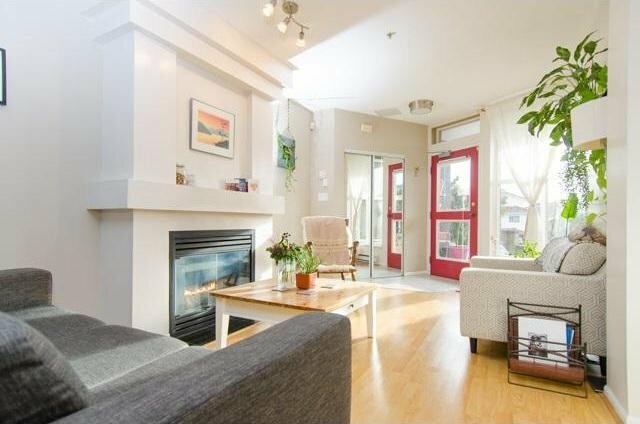 Very unique townhouse, on a quiet residential street in a top location, at an unbeatable price! South facing, bright and sunny w/ private patio located up off the street. 1 bed + den, gas f/p, renovated bathroom, laminate floors, recent paintwork. Excellent open plan living/ dining area. Steps to Fraser and Main Street shops and amenities. Dickens catchment area. In-suite laundry. Gas included in strata fees, 2 secure parking spaces, storage locker, building has bike storage too. Pets and rentals welcome with restrictions. Townhouses like this are very rare. More information and photos on our web site, look us up! Open house Thursday April 7th 5-6pm, Sat/Sun April 9/10 1-3pm.